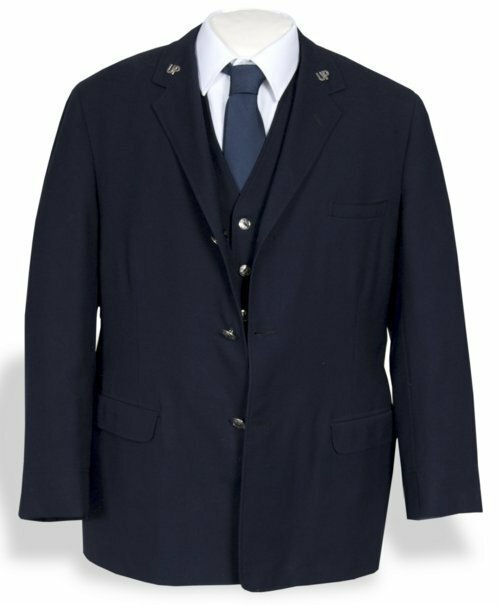 Brakeman's uniform jacket for the Union Pacific Railroad Company. Single-breasted jacket of heavy, dark blue wool has narrow lapels with metallic "UP" pins and buttons. Made for Gerald W. Agin in 1965 by the Kansas City Custom Uniform Company of Kansas City, Missouri. Agin lived in Kansas City, Kansas. He worked as a switchman and brakeman for the Union Pacific for 40 years, retiring in 1981. Brakemen were responsible for manually braking a train before the advent of the air brake in 1872. Agin, who worked in more modern passenger trains, was likely responsible for collecting revenue, making announcements, and operating train doors.